Dale Maffit Reservoir is a 200 acre lake constructed in the 1940s as a backup water source for the City of Des Moines, Iowa. 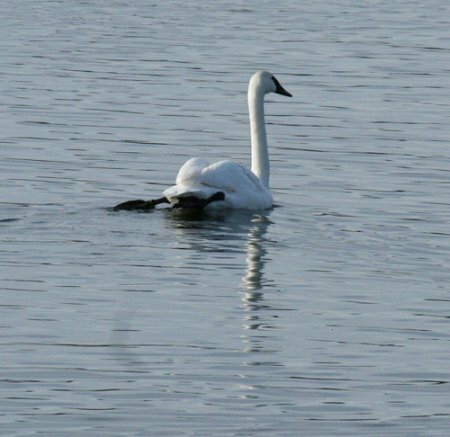 It is surrounded by about 1500 acres of woodland and prairie, intended to keep the runoff to the Lake reasonably unpolluted. This winter the lake froze over early and has remained frozen over to this date, March 10. Frozen, that is, except for a small hole that Canada Geese managed to keep open throughout extremely cold winter. With rapidly warming weather the past 2 days, the hole has greatly expanded. It is at the north end of the lake, easily viewable. I live about 6 miles from Lake Maffit. On January 20th I stopped by to see what was there, and was pleased to find several Trumpeter Swans, some Common Goldeneyes, a few Common Mergansers, and the usual plethora of Canada Geese and Mallards. On February 13th among the Canada Geese and Mallards were Cackling Geese, Redhead Ducks, a Ring-necked Duck, and the continuing Goldeneyes and Common Mergansers. On February 21, the swans were back, and there were a few Pintails to add to the mix. 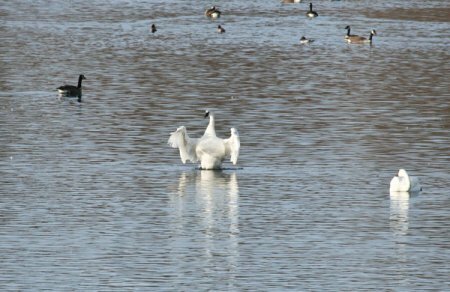 On February 27th, all of the species of ducks, geese and swans mentioned above were still present at the little water hole surrounded by ice, and adding to the mix was a single Bufflehead. and 4-6 Cackling Geese. The number of duck species now included 2 Green-winged Teal, 6 Ruddy Ducks, 4 Lesser Scaup, 8-10 Pintails, 2 Ring-necks, 1 Bufflehead, 50 or so Redheads, 100 or so Common Goldeneyes, 10 Common Mergansers, and, of course the ever present and quite numerous Mallards. 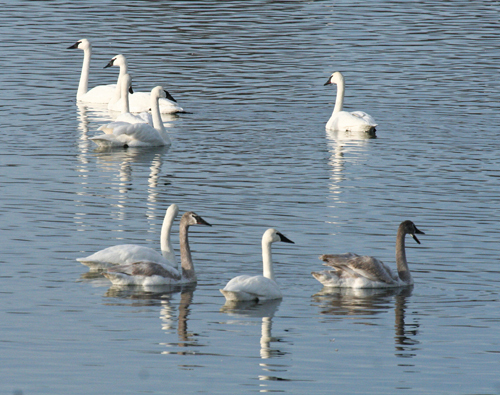 On March 8th, there were 37 Trumpeter Swans in or around the hole. Canada Geese numbers were well over 1,000. 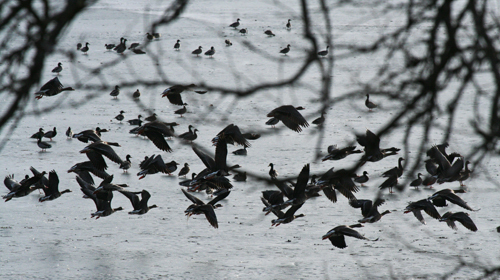 A flock of at least 40 White-fronted Geese and about 10 Cackling Geese completed the list of geese present. 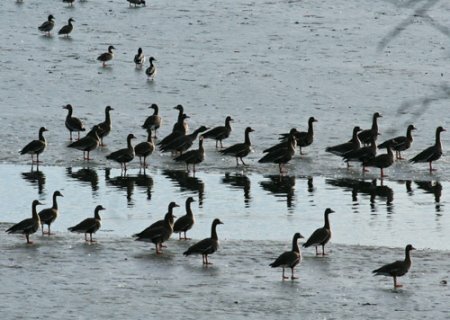 All of the duck species seen the preceding day were still present, but in increased numbers. And, as the bonus for the day, cavorting among the Mallard Drakes was a dramatically dark Black Duck. I was very happy to see this big duck, because in many years I fail to see any of this more easterly cousin of the Mallards in Iowa. On March 9th the weather turned warm for the first time this calendar year. All of the same cast of characters were still present, and added to the mix were 6 beautiful Hooded Mergansers. There were 49 Swans at the hole. 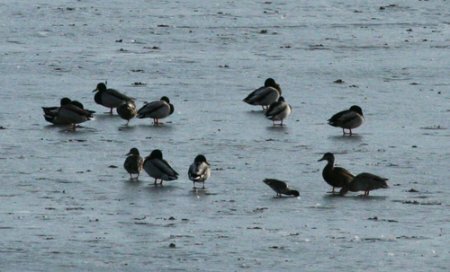 They began to depart about 10:00 a.m.
Hopefully, the Black Duck and one of the 2 Buffleheads present this morning will also show up in the photos. All of the other species, except Cackling Geese, were still present, and, except for Canada Geese, in larger numbers. When I returned to Lake Maffit about 5:00 p.m., there were at least 2,000 White-fronted Geese, and very few Canadas; a nice change. In addition I saw my first-of-the-year Red-breasted Mergansers (3) and a single Wigeon. Ring-necks were much more plentiful than in the morning. That made it a 14 duck day. I think that’s a record for me. I will be anxious to see what’s new there tomorrow. 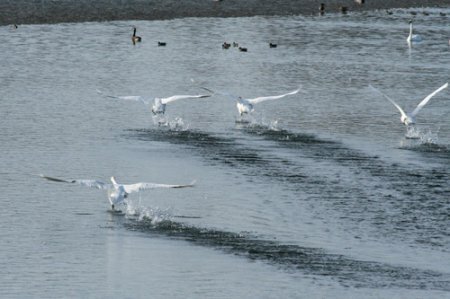 Canvasback or Shoveler are the most likely, because my other three expectancies, as yet unseen in 2014, the Wood Ducks, Gadwalls, Blue-winged Teal, don’ fancy the big open lake. Maffit Reservoir is a jewel. 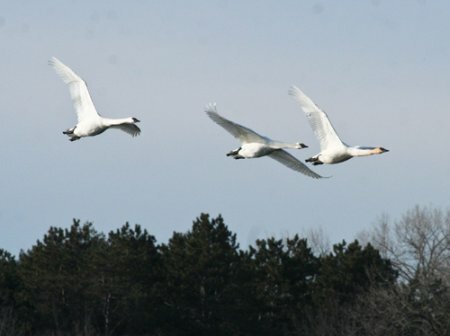 Hopefully it will continue to be available to the migrating flocks to provide rest and nourishment on their cold fall, winter and spring stopovers. I can’t stop without mentioning the nightcap: at about 6:30, as the sun was setting, V after V of Snow Geese flew high over our house, heading northwest. Spring is surely here.